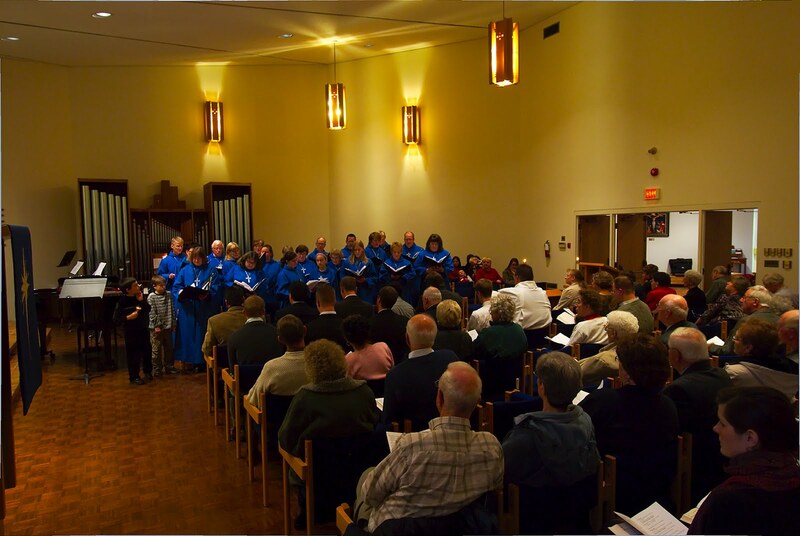 On the second Sunday of Advent the seminary’s Martin Luther chapel was filled with musicians, the seminary family, and visiting worshippers for the annual Advent Lessons and Carols service. The choir of Resurrection Lutheran Church (under the direction of Dianne Humann) joined the Seminary Choir (directed by Tara Lyn Hart) to sing responses and lead the hymns that accompanied the six Advent lessons. Dr Tom Winger tag-teamed with Mrs Humann on the organ and piano, and young people from Resurrection added the music of strings, brass, and handbells. Many visitors commented how important this event is to their annual observance of Advent, avoiding the secular temptation to rush too soon into Christmas. Following the service, the seminary community gathered at Resurrection (down the hill) for its Christmas dinner. The students prepared the food and entertained. Representing the Seminary Guild, Mary Silver gave each student a grocery gift card, and the student assocation gave Christmas books and goodies to the children, supported by a generous gift from Mr and Mrs Richard and Celine Weitzel. The seminary community’s prayers are with the Hart family, who were unable to be present at the service or dinner, as they were attending to Perry’s father in his illness.